Feeling tired and run down? You’re not alone. Vitamin B-12 is mostly found in animal products, but even meat-eaters may not be getting enough. The American Journal of Clinical Nutrition reported in 2000 that 39% of individuals tested had low-to-normal levels of B-12 in their blood. 17% had levels low enough to cause symptoms of deficiency. If you thought, because you’re a vegetarian or vegan you’re not getting enough Vitamin B-12 in your diet, you’d be right, since the vitamin is not found in plant foods. However, our meat-eating cousins are not faring much better, either. An article in the American Journal of Clinical Nutrition that appeared in 2000 reveals that 39% of individuals tested had low-to-normal levels of B-12 in their blood, and 17% had levels low enough to cause symptoms of deficiency. 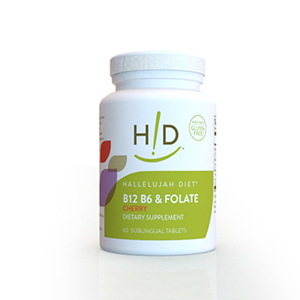 You can read more about B12 on the National Institute of Health, Office of Dietary Supplements website: http://ods.od.nih.gov/factsheets/VitaminB12-HealthProfessional/. All of Hallelujah Acres supplements and snack foods pass our rigorous high standards, as set by The Hallelujah Acres Foundation, our scientific research division. We don’t sell anything that we wouldn’t use ourselves.